There are many places in Mussoorie to visit. It is most likely that you can’t visit all those places. So, before went to Mussoorie plan your trip day wise and select best places which you can visit in those days. One more tip doesn’t just look km distance between places because most of the place has walking distance of two to three kilometers. The Kempty falls are surrounded by high mountain ranges and are situated at an altitude of approximately 1,364 meters above sea level, thus giving it a wonderful surrounding to just sit and listen to the sound of the water which falls on the rocky bed of the water below among the lush green vicinity. The highest peak in Mussoorie, with an altitude of over 2,290 meters above sea level and provides some amazing and never seen before views of the mountains that house the holy shrines of Kedarnath and Badrinath. To give its visitors a clearer view of the picturesque surroundings a Japanese telescope has been installed at the edge of the cliff also the place is highly preserved from most commercial activities. The centre of the Tibetan settlement in Mussoorie, happy valley is situated at a short distance from the mall road. This is the place where Tibetans first arrived in India when they fled from Lhasa in 1959, led by their spiritual leader dalai lama before he moved to Dharamshala. The place is lined with oaks and deodars and has several small hotels and cafeterias and as you walk further into the town, you will get to experience calm like no other. 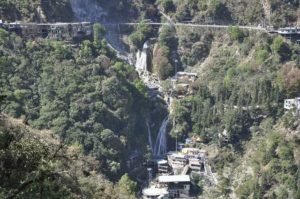 The road takes its name from the rock which is shaped like a camel’s hump on its back and stretches around a distance of about 3-4 kilometres from Kulri bazaar to the Library Chowk in Mussoorie. The road is ideal for a walk as one can get amazing views of the valley and the mountains from here. The place is great for the photographers who are looking for great shots to capture of the valley and the mountains that surround Mussoorie. The second highest point in Mussoorie, the place’s name is derived from the event of firing cannon from this place to tell what time is it to the people during the British colonization hence giving it the name ‘Gun Hill’. The place lies at an altitude of 2,024 meters above sea level and offers some majestic views of the surroundings. Located at 6 kilometres on the Mussoorie-Dehradun road, the lake was recently developed as a picnic spot by the city board and the Mussoorie Dehradun Development authority. A nice small lake, which is created by a natural water fall, while going down from road to lake in the way very good small water fall is there , you can see duck swimming in lake, you can ride a paddle boat here as well and enjoy the amazing surroundings. Christ church was built in 1836 and is considered to be the oldest churches in the Himalayan ranges by the British during the British colonization in India. Possessing Gothic design and architectural styles, the stained glass windows in the Church represent the events in the life of Jesus Christ. Apart from this, the high altar in the Church presents the sufferings of Jesus Christ. The walls and interiors of the church are beautifully decorated to grab attention of visitors. Built in the year 1832, the house belonged to the famous surveyor and geographer, Sir George Everest, after whom the world’s highest peak is named. He stayed in Mussoorie for around a good 30 years and the house showcases some interesting facts about the famous personality. It is 6 km from Gandhi Chowk / Library Bazaar and is accessible by vehicle, although the road is very rough beyond Haathi Paon (elephant’s foot). The temple is located at a distance of around 9 kilometres west from Mussoorie atop Benog hill at an altitude of 2,240 meters above sea level. The place enshrines a centuries old idol of the Hindu deity Goddess Durga, the manifestation of supreme beauty and deadly power in the Hindu mythology. Also famously known as the mall road, it is a total shopper’s delight with everything in the same location. The Mall is like the lifeline of Mussoorie with almost everything located on this very stretch. Be it attractions, hotels, restaurants, shops – The Mall houses them all. To mention just 10 places out of the many attractions in “The Queen Of Hills” is definitely based on our experience and opinion. However, we have tried our best to mention the places we thought, were a must visit. In case we have left out any place that you think needed to be mentioned, please feel free to mention the places in your comments.